Osa Atoe’s hands are caked in clay, but that’s nothing new. In her backyard workshop, surrounded by half-finished jars and pots, a bowl filled with old cassette tapes and a detached mannequin head, Atoe is at the wheel, throwing another lump of red clay. 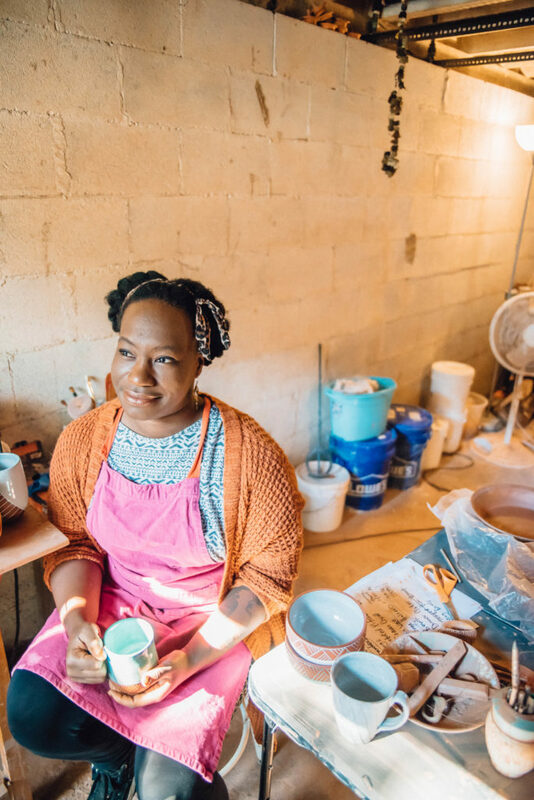 In only two and a half years of selling her handmade ceramics, she has become a prolific potter, with nearly 500 sales on Etsy and countless more through retail and local markets. She was also one of the first participants of the Mid City Makers Market. 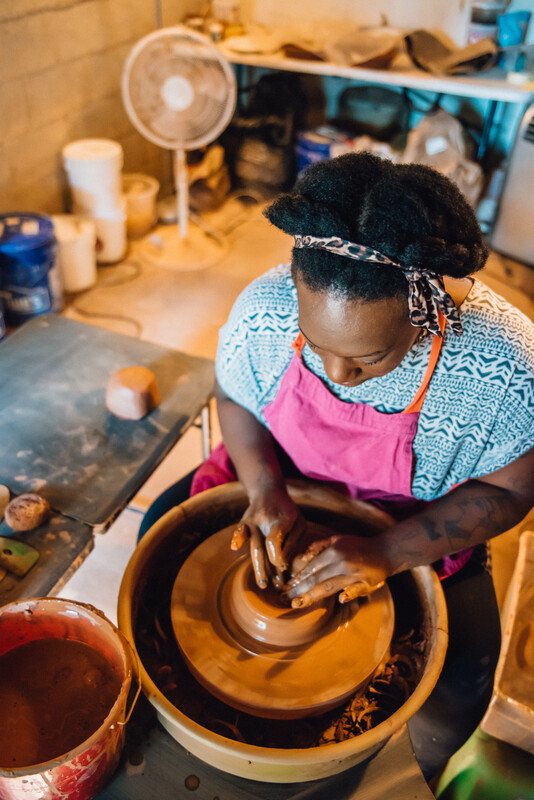 With pieces featured in Southern Living magazine and interior design site The Jungalow, Atoe’s name recognition—and the recognition of her signature, etched pottery—is only growing. She’s clear, though, that no matter how quickly Osa Atoe the brand has grown, Osa Atoe the artist is still evolving and finding her way. 1. Atoe originally studied to be a teacher. 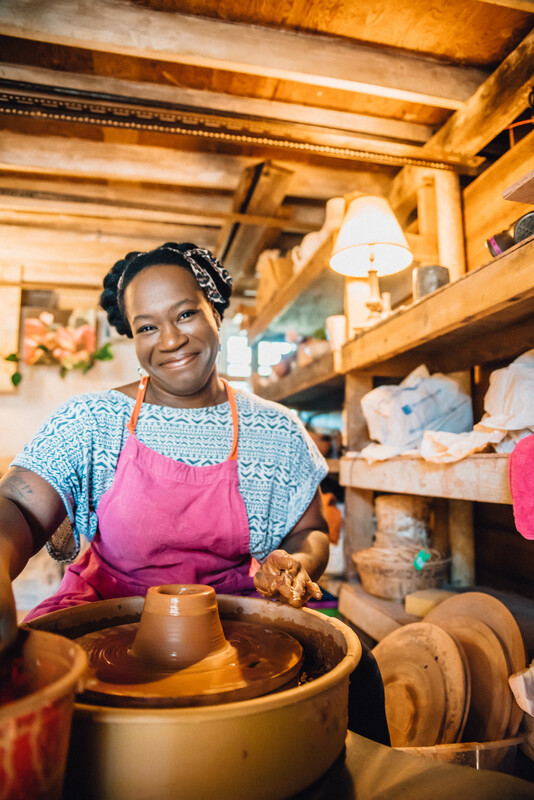 She left the career to become a self-employed potter after taking community pottery classes in New Orleans in 2013. 2. Her art is influenced by many cultures. She draws inspiration from her parents’ Nigerian roots, as well as elements from Greco-Roman and Native American cultures and beyond. Most of all, they’re totally American, she says—a reflection of the true U.S. melting pot. 3. This former Portland resident is a veteran of the punk rock scene. She’s been invited to show in two exhibitions at the Conference of the National Council on Education for the Ceramic Arts in Pittsburgh this year, one of which will showcase the art of current and erstwhile punk artists. 4. She’s phasing out of retail in stores, focusing more on arts markets and museum work. Your best bet to get one of her pieces: a local market or her Etsy store, Pottery by Osa. 5. She’ll start teaching adult pottery classes at Journey Lab this month. More dates to come throughout 2018.